A RITE of passage and a celebration of academic success saw more than 60 students awarded with their nursing badge at a ceremony in Bundaberg yesterday. 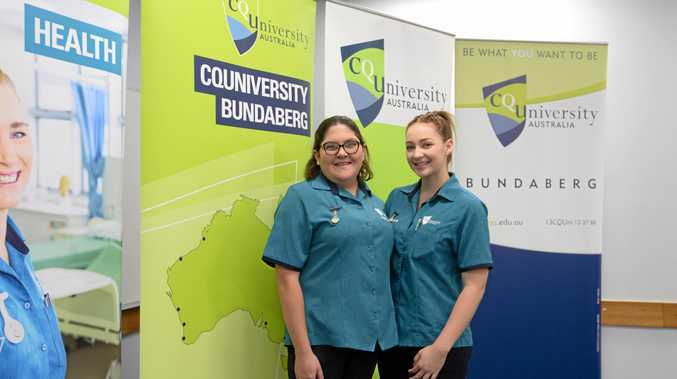 CQUniversity Nursing Lecturer, Colleen McGoldrick said the ceremony hold special significance for nursing students who were set to embark on their careers in the field. "A badging ceremony is a very special and symbolic event for those entering the nursing profession,” said Ms McGoldrick. Students Cassandra Lawson and Sarah Dray both received thier badge. They said while they initially had no intention of a nurse's career, a stint of work experience saw Cassandra fall in love with the profession, while a suggestion from Sarah's friend set her on the path of nursing. Cassandra said the past three years of study had flown by and she looked forward to helping people. Sarah said she was equally excited for the next step in her nursing career and would recommend the study to anyone interested. The two students said while nursing was hard work, it was rewarding. The giving of badges is a tradition with origins stemming from the Maltese Cross.